This page is dedicated to beginners. It is all the stuff I wish someone had told me eight years ago before I made a ton of mistakes and spent far too much money. It was the first gasifier I ever used to coat a fan with tar and then fry the motor from heat. There was so much wrong with it I would need a complete page to list it all. It was also heavy and awkward to move around. It’s almost effortless for me to pick up my current 20lb Victoria and move it around. 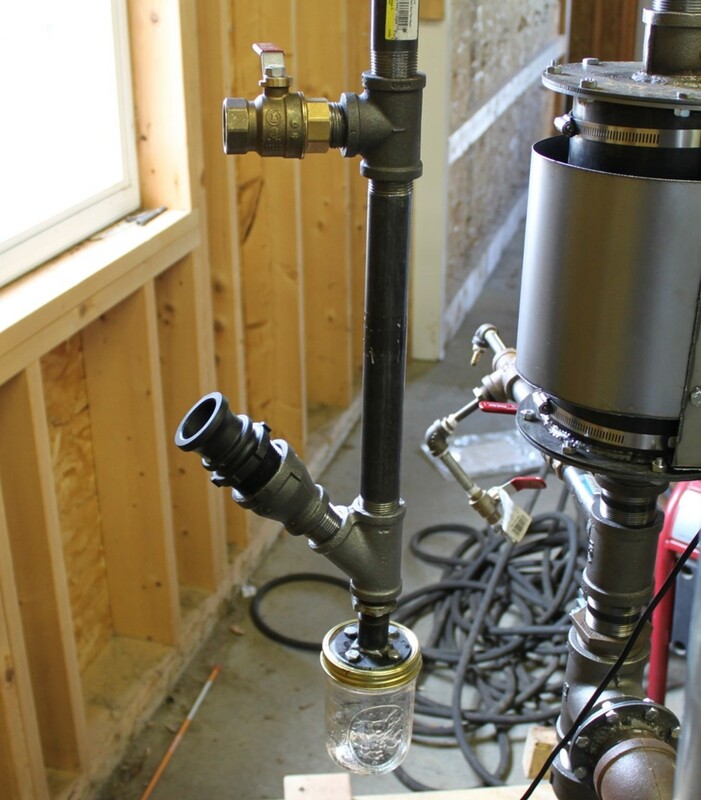 only make about one inch of water column suction at zero flow. That might barely warm up a chunk machine but it is too little suction for a chip machine. It will also fry the motor from excessive heat. The enamel on the motor windings just can’t tolerate uncooled wood gas directly from the gasifier. 4.) Install a puff lid. When a gasifier is refueled air enters the fuel hopper. As tar gas builds up internally eventually it will hit a combustible ratio and the hopper will detonate. A puff lid is a device that allows the lid to lift to relieve the hopper pressure so the gasifier doesn’t split open violently. It has happened and people have died!!! 6.) Build a proven design to start with and USE THE FUEL IT WAS DESIGNED TO RUN ON before you begin changing things. I made a mess of the Fluidyne gasifier design because I ran chips in it when it was designed to be a block fueled machine. 7.) 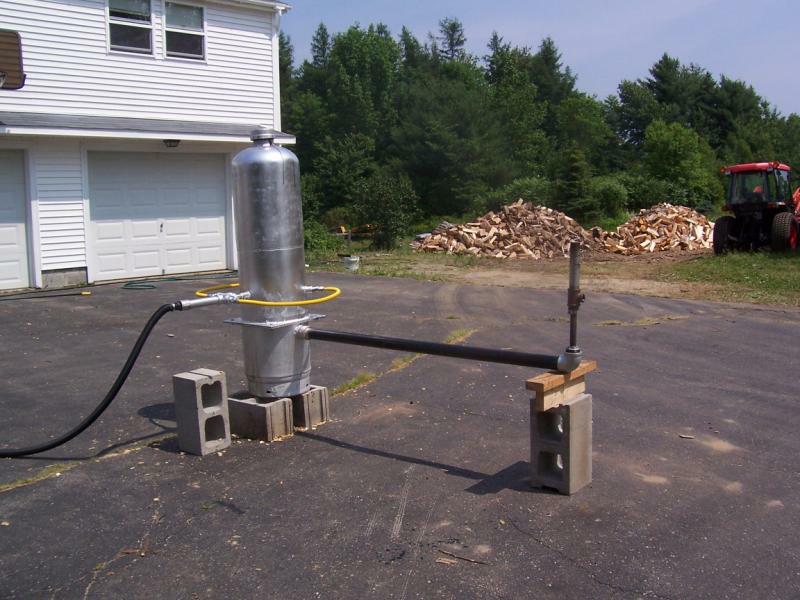 Build an ejector to create suction to start your gasifier and flare the gas. An ejector is just a compressed air nozzle that blows air down a pipe so that all the air behind the nozzle gets dragged along with the high velocity flow. They are not perfect because you do not have control of the fuel/air ratio but they do tolerate all the heat and tar that you can throw at them. If you want to just buy one check out the Get Hardware page. 8.) 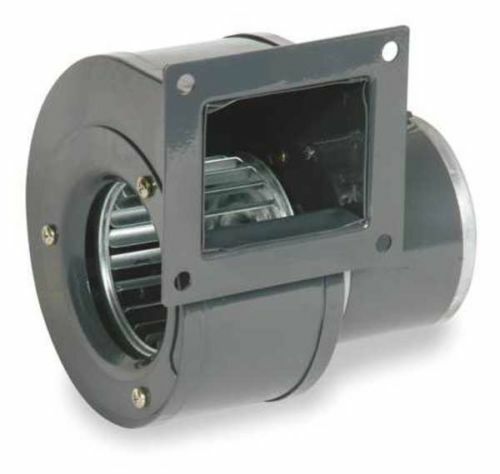 Create separate hopper, hearth, and ash bin sections so that hardware is reusable. Connect them with flange joints and be sure to weld the section body tubes on with the flanges tightly bolted together. I also add timing marks so that the sections always go together the same way. That way any waviness in the flange stays with its mating curve. 9.) Large chunky fuels are easier to gasify with low tar than small fuels. The reason is that there are larger voids between the fuel chunks where oxygen can attack and burn the tar molecules. 10.) When thinking about grate openings a good rule is to start at 3/4 the width of a typical fuel particle. This works nicely for pellets and chips. Users that are ambitious enough to use blocks may want a smaller fraction like one half. 11.) Make sure your cyclone exit temperature is over roughly 250F. You want only dry powder coming out of the cyclone. If your fuel is dry there should not be enough condensate to wash the char dust out. You REALLY do not want char dust going into the gas cooler. That will act as a filler for any tars and build up large amounts of insulating material. 12.) Always leave the gas cleaning system going up hill. The reason is that you could be making perfectly tar free gas but if the sooty condensate gets to the engine it can flow into the throttle plate pivot, dry, and bind the throttle. This is especially problematic for small engines with light return springs. 13.) Prime your gas system! This is to avoid excessive engine starter use or use of the pull cord to pull the gas from the gasifier to the engine.